If the gray and snowy weather of February told us anything, it’s that winter needs a little pop of color. While looking at all the marvelous crochet patterns published in the last month, I am delighted to see so many feature colorwork. Here are a few that I just had to share with all of you. One of my favorite color applications is color blocking. It’s simple and fun, and in the Cowl Sweater Vest by Breann of Hooked on Homemade Happiness, it’s very flattering. I love the little stripe of the one color that Breann carries into the next block of color. 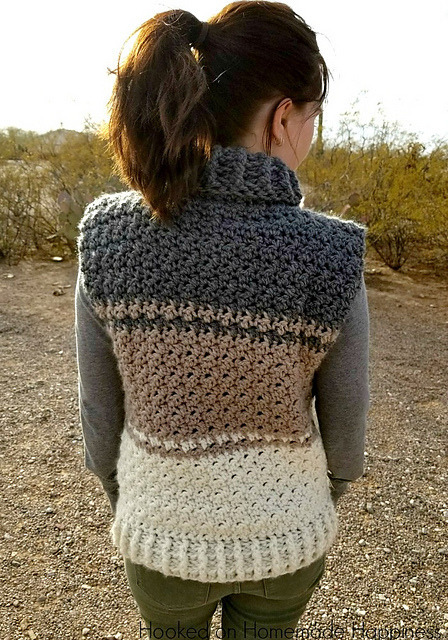 With bulky yarn, you’ll have this cozy vest crocheted for the next time the temperatures drop. The Olympics may have come and gone, but they’ve left amazing inspiration for all of us who play with wool. 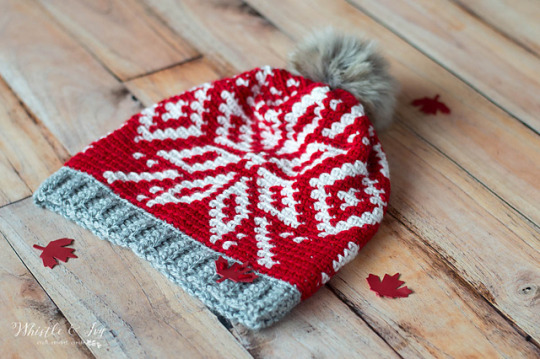 Using the tapestry crochet technique, Bethany Dearden created her Chinook Toque and Neva Hat inspired by the Canadian and USA Olympic team hats. It may look and sound complicated, but tapestry crochet is simply changing colors within the last step of a stitch to create a design while usually following a chart. I always get excited when I come up to a color change and see the design take shape. 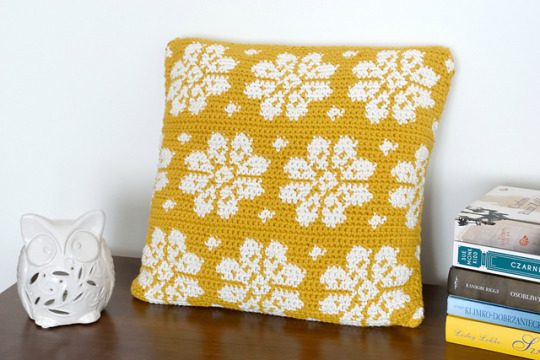 Another fun colorwork crochet project published last month is the Dahlia Pillow by Sylwia Kawczyńska. In this pattern, Sylwia uses the crochet Intarsia technique, which is very similar to tapestry crochet in how the stitch itself is worked. The difference comes with how the non-working yarn is held within the piece. This pattern is so easy to customize with color and makes for a great home accessory. This last pattern plays with color in such a clever way. 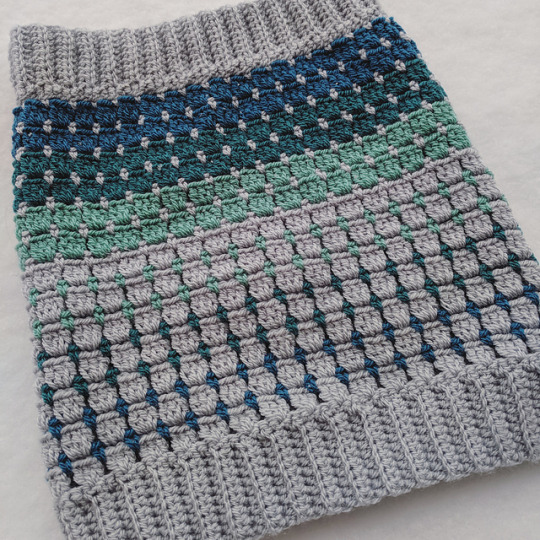 Liam’s Cuddly Cowl by Jessica McLean changes color every row between a neutral main color and three accent colors. The color shifts are gradient-like through the body with a corrugated ribbing at each end. This would be a fun weekend project, and would work great in various weights of yarn. Time to check your stash and see what colors jump out to create your next colorwork project! 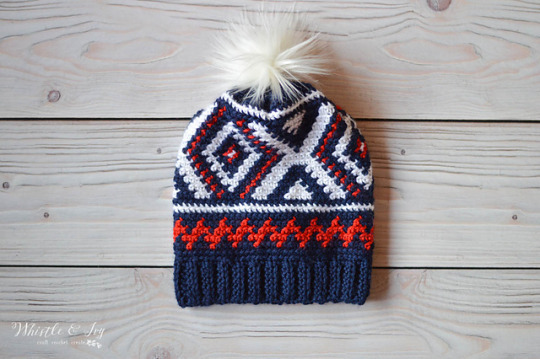 Written by Aimee Hansen of Yarngerie, who has also been a featured crochet designer in Knitcrate. Check out her featured patterns: Favorite Things Shawl &Phoenix Rising Shawl in the Knitcrate Shop!